Hand-picked, exclusively managed family villa rentals (with pool and garden!) in Catalonia (Barcelona, Costa Brava, Costa Dorada) and the Balearic Islands (Mallorca, Menorca Ibiza). Our vacation rentals are close enough to tourist ‘meccas’ so as to enjoy all the benefits these areas have to offer, yet far enough ‘off the beaten track’ where our guests have the opportunity to enjoy and experience the real Catalonia/Spain. We pride ourselves on personalised unbiased vacation recommendations, unique (gastronomical, adventure, cultural) activities and exceptional service. Catalunya Casas: Villa Alcover in Costa Dorada, located by a secret lake! Catalunya Casas: Traditional Villa Baile for 6 guests, just 4km to the beach! Catalunya Casas: Villa Bunia up to 10 guests, with private secluded pool and just 10km to the beach! A great Spanish vacation begins with a private holiday rental from Catalunya Casas. 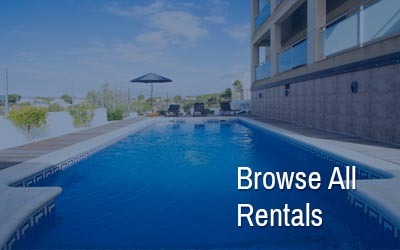 Whether you desire a classic Catalan Villa in the hills above Barcelona, a beach cottage on the world famous Costa Brava, a relaxing bungalow on the Costa Dorada, or a historic castle complete with private pool on one of the Balearics Islands, Catalunya Casas has the perfect Spain villa rental for your holiday. Catalunya Casas represents a multitude of villas, cottages, houses, apartments, and castles in the most popular locations in and around Barcelona, as well as villas on the Balearic Islands of Ibiza and Mallorca. We invite you to explore our website for information on the region’s most popular activities and attractions, or contact one of our holiday experts at Catalunya Casas for personal assistance in finding the perfect Spain rental property. If you are travelling for business, we also offer Extended Stay Corporate Rentals and Housing.